Today we’ll look at keeping your mistakes. When shooting outside in natural light with a reflector, I pretty much shoot in Aperture Priority and use Exposure Compensation to get the correct exposure. I like to control my Depth of Field this way and always get great results. However, you must be aware of your shutter speed. If you shoot at f/5.6 and the light causes your shutter to be low, like 1/100 and you add 2/3 of a stop of exposure compensation, then your shutter may go to 1/60 which may not be fast enough. So you need to be aware of that and adjust ISO from 100 to 200 or 400 to get a faster shutter to freeze the action. Remember, you move, the client moves, the earth moves, so it is necessary to have a shutter speed fast enough to counter all of these movements. Also, while this is not a RAW versus JPEG argument, always shoot in RAW as you can adjust your exposure up or down by up to 3 stops and save an image. For today, I shot this natural light headshot of Shaza at Unique on Saturday. I had left this station to set up another lighting station for the workshop attendees and came back to take a few more frames and didn’t change my exposure back to my original settings for this shot. Now the image looks like the others in the set that were correctly exposed. However, I though to myself, why correct it? I like the overexposed high key look and as long as I like the image, why not try to keep it. My solution and the solution I teach to everyone is that if you don’t like an image or have a mistake, swap the image to Black and White. Black and White has a certain elegance that color lacks. Without the noise of color in the way, black and white images reveal a beauty that sometimes color cannot. By converting to b/w and pushing contrast a bit, I have this beautiful b/w image. So for today, keep your mistakes. Don’t immediately delete them as they may be able to be saved and turned into art. That’s it for today. Till next time, keep making mistakes! Last Saturday’s workshop at Unique Photo dealt with taming hard sunlight. As photographers, we need to learn how to use every light source at our disposal. If we shoot in hard light, then we need to see and use hard light or know how to diffuse it to get the best result for our client. I like to use my scrim to control hard sunlight. Some clients have crazy schedules, so shooting at noon on a sunny day is the only time they have. So we need to understand how to get the shot “in the can” and please our client. I have the California Sunbounce 4×6 frame and Zebra/White reflector. Coming in at $334.00, this is not a system for the faint of heart. As part of a sponsorship with California Sunbounce, I received the frame and textile for free a few years back. But I wanted to use my CS frame as a scrim, or light diffuser. When I saw the cost of a 1 stop scrim textile, at $158.00, I cringed. So I headed to my local Marshall’s and got a Shower Curtain for $5.99 and strung it across the CS frame. But, just Google DIY Scrims and you’ll come across a bunch of online tutorials on how to build portable scrims of all sizes on-the-cheap using PVC Pipe and fabric from a craft store for anywhere from $20-$50.00 depending on size. This is the move. Don’t spend more than you have to!! Using scrims is easy, simply place the diffusion in between the sun or light source and your subject. Used in this set up, the CS scrim is unwieldy, so I used my Matthews C-Stands, Avenger Boom arm, and 3 15 pd weight bags to keep it all steady. A slight breeze picked up during the shoot, so the weight bags kept everything stable. Here is another shot from the workshop. The scrim is one of the most simple yet versatile tools in your kit. They can be built cheaply and used all over. You can harness the power of the sun or just shoot a light through it. Whatever the case, scrims are a great and simple way to control your light. Many thanks to Shaza Lauren for modeling at the workshop and to Unique Photo for having me in to teach at their annual Camera Show. I was at Unique Photo last Saturday running two lighting workshops. I’ll dissect the shoot for you as the week goes on with other posts, but for a quickie post today I’ll give you a few proof images from the two shoots. I’ll put together individual posts on lighting technique and setups throughout the week. I’ll be planning a Beauty Headshot Workshop for July 9 and heading to Boston to Theia Studios on July 16 for “The Headshot” Workshop. More on that this week too! Today let’s take a look at a simple black and white conversion. Black and white images area powerful and beautiful. Without the noise of color, there is an understated elegance to a black and white image. In this image, I want to go to B/W and then push contrast a bit. Here is the side-by-side example. Now I have a beautiful b/w image that only took a few seconds to create. I’ll be at Unique Photo tomorrow, so I hope to see you there! Sorry for the delay in posting, but it has been a bit crazy. This Saturday, I’ll be at Unique Photo’s Camera Show running two lighting workshops. I’ll be teaching how to tame hard light and also how to fall in love and use it to you advantage. I’ll be using scrims, reflectors, and some fill flash to get great results. I’ll also show you how to build the outdoor studio. We’ll be shooting at the rear of the building on the loading dock and going for Industrial Fashion looks. I’ll be supplying all the gear for you to shoot 3 models in 3 stations in both locations. Don’t miss out on this wonderful event put on by Unique Photo. The Strobe Light workshop for today has been cancelled due to inclement weather coming through by noon today. I will reschedule for next Saturday and post all the information on Monday. I’m running a headshot day on June 12, 2016. I’ve been working with Karen Wagner Talent and IMTA and am offering any model or actor who needs new headshots a chance to get them before the IMTA event. But this is also open to anyone needing a headshot. One professionally retouched image in hi res and web ready. I am also offering hair and makeup for $80 on that day. I’m going to tackle three topics here, starting with Photoshop Friday on an actual Friday! For today, I’ll show you how to do a simple color correction with the setting in PS and a keystroke command. Need a quick correction, this is it. Once you click the command or choose the adjustment, voila! You have a corrected image. The tone is still there but her shirt is whiter as so are her eyes and teeth. This is a simple way to get great results with just a few clicks! I’m a new Interfit Ambassador and have received a full complement the new Interfit S1 battery powered monolights. I’m still in the shake-out phase, but let’s get together and shoot location strobe lighting. The new S1’s compete directly with the Profoto B1 and B2’s for half the price. The difference: the S1’s come with batteries for location work and an inverter for mains power. You can shoot plugged in to a wall outlet inside and then go outside with the same light. It is quite ingenious. And simple light setups to really explore the power of location strobe lighting. 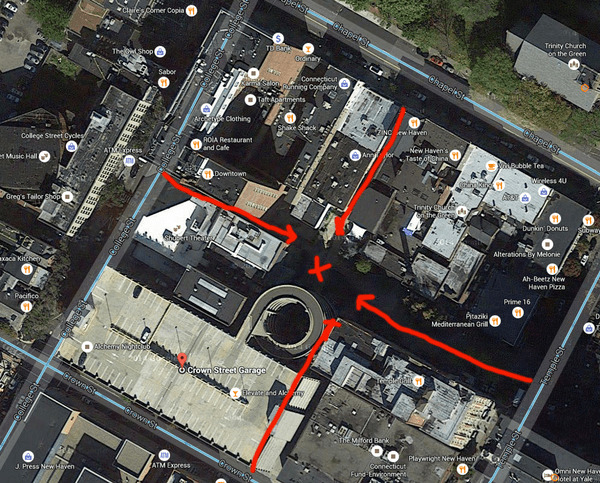 The location is behind the Shubert Theater in the courtyard in the center of the block. You can enter from Crown, Temple, College, or Chapel streets. This is an awesome spot to shoot in New Haven, so let’s take advantage of it and shoot location strobes! Headshot day may be moved from the Courtyard Marriott to a location due to costs involved. That’s it for now, till next time, get outside it’s gorgeous here in the North East! Photoshop Friday on a Friday! I’m going to give you a quickie lesson today on sharpening soft images. Sometimes you get an out-of-focus image. Sometimes that softness is really cool and you just leave it for artistic reasons, but other times the soft image you shot is the final image choice of your client. Now, you have to work on it to sharpen it for print output. One great way to sharpen and then move forward in retouching is using the High Pass method. Here is the final sharpened proof ready for retouching. I normally sharpen after I’ve retouched, but here the image needed a bit of help before beginning to soothe skin. That’s High Pass Sharpening. This is a great way to sharpen and image before or after retouching. Here, my client wanted this image, so I sharpened it so it looked better before heading to retouch. Next time, I’ll show you how to soften skin using this method with a few extra steps. It works amazingly well and allows you to selectively apply softening and sharpening at the same time. Till next time, stay sharp! Till then, happy location shooting!